Welcome to Tasty Tuesday on The Blended Blog were we share kitchen and food things. Truthfully, I'm not great in the kitchen. While having a random discussion with my husband several years ago where we were asking random questions and I asked him who he thought was a better cook, him or I. He said he was. Then why in the heck am I the one doing all the cooking??? I am the first to admit that I am not the best in the kitchen nor do I really enjoy cooking. With that being said, I have a few go to recipes that don't disappoint. 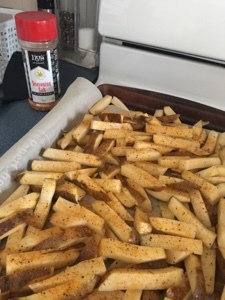 Most recently we started making homemade fries. Tasty and healthy is totally my style. 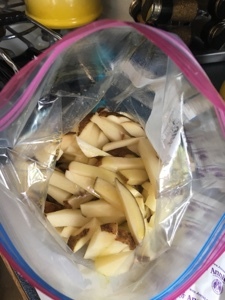 For years, I made homemade fries by cutting my potatoes with a knife. They were never shaped liked fries, it was more like a chip shape. Then I discovered my Starfrit Fry cutter. Seriously this is the best gadget ever. EVER. In 8 easy steps you get the best tasting homemade fries you can imagine. 2. Slice the potatoes in quarters so it fits in the fry gadget. 3. 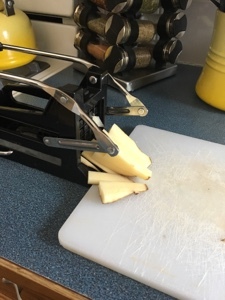 Crank the handle to shoot the fries out the other side. 5. Add oil to the bad and shake well. 6. Spread fries on a cookie sheet. 7. Sprinkle with your fave seasoning. I like Hy's. 8. Bake at 425 degrees for 50 minutes or more until brown. My biggest complaint is how long they take to cook. You have to be organized to make sure your fries get in an hour before you are ready to eat them. We've been known to eat barely cooked fries because we did not put them in the oven soon enough. Big mistake. Huge. They are much better if they cook until browned. 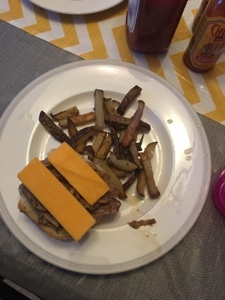 To me, french fries go best with meat on a bun. Last night we had beef dips, one of my specialties. Again, a super simple recipe that always seems to please. It is one of my husbands favorites and my kids will tolerate it. 2. Mix powders with 4 cups of water and pour over beef. 3. Cook on low heat for as long as possible. 4. Shred beef before serving on buns. 5. Dip buns in the au jus and enjoy! 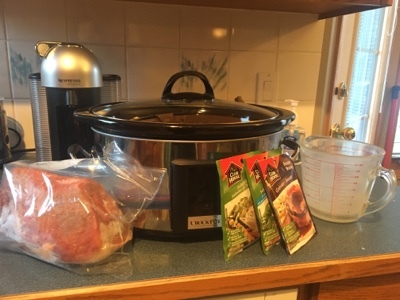 I rely heavily on my slow cooker during hockey season when we are on the go all the time. There is nothing better than coming home after being at a cold rink and smelling supper when you walk in the door. Honestly, I use my slow cooker year round. If you have a great recipe, send it my way. And yes I only use half a bun, I want to save extra room for my yummy fries!